Ever wondered how those massive planes stay hidden from view? We explain all in today’s big guide on stealth technology. You have no doubt heard of stealth equipment. 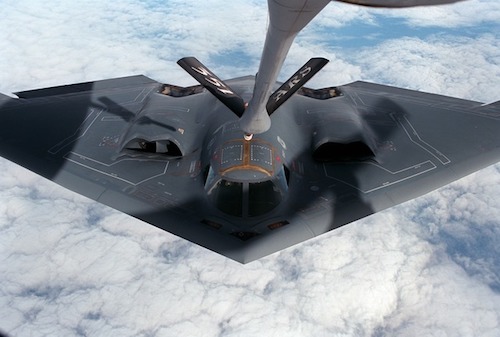 This isn’t some Harry Potter-esque invisibility cloak that makes items and airplanes – perhaps stealth bombers – invisible to the human eye and to radar; it’s actually a very sophisticated form of technology that militaries are using to great effect, particularly in conflict. You will no doubt have seen a stealth bomber on the news. This is an airplane that is capable of dropping bombs accurately onto a target, but it cannot be detected by radar on the ground. This gives the bomber the ideal situation in which to hit their target – they have the gift of total surprise. To understand how all of this works we need to delve a little deeper. What is stealth technology and how does it work? Why is stealth technology useful? To understand what stealth technology aims to do, we first need to understand about radar. Radar is a method of tracking something, via radio waves and energy. Radar uses an antenna, which is used to pick up signals. In this case, it would pick up the energy transmitted by a stealth drone or bomber, and it would give the target on the ground prior warning that something is coming their way. The radar allows the target to find out how long it is going to take for the object to arrive in their vicinity. A general commercial plane can be tracked very easily using this technology, because the metal body of the plane works to reflect the signal and send back information to those on the ground. If you do not want anyone on the ground to know that you’re coming, you will need to use stealth technology to arrive unannounced. So, the aim of stealth technology is to be invisible to a radar antenna. There are a few ways to achieve this, but the main two are to shape the plane/object so that any signals that the object reflects will not bounce back down towards the radar, to pick up information, and instead it will reflect away. The other method is to cover the object in a material that absorbs the signals from the radar, and basically turns them into nothing. As you can see, stealth technology is very sophisticated and complicated. A stealth plane or bomber is shaped flat and it has edges which are very rigid and sharp. This is because when the radar signal makes contact with the plane, the signal will bounce back at a different angle, and it won’t head straight back down to the antenna on the ground, where the signal can be read and interpreted. This is why when you see stealth bombers in the news or on TV, they look very odd in shape – this isn’t for fashion, this is about being invisible to radar. The material which covers the plane is also designed to absorb radar signals rather than transmit them. Stealth technology is mainly used in conflict and in the spy world. It is used in reconnaissance missions and in military attacks. Militaries the world over have poured millions of dollars over the years into working out how to use stealth technology to its greatest benefit. It has more recently been employed by stealth drones, so they can go into areas where they don’t want to be seen. Drones are small, remotely controlled planes which can fly into an area and record pictures, and pick up information to report back to another source. They can also be used to drop bombs to devastating effect, and have been the weapon of choice for many countries in their “war on terror” in the middle east. By staying hidden, blame is also very difficult to attribute. Let’s look at a recent example in North Korea. North Korea is a very secretive country, which is prone to exaggerated threats. It’s a country that isn’t trusted, and one that is feared, not because of its power, but because of it’s petulant attitude. For this reason, it’s a country of great interest and devices like drones can give us an insight into just what is going on behind closed doors. This is especially important given the recent nuclear threats and missile tests that North Korea have been issuing. How a stealth drone works is very complicated, but again, it uses stealth technology in the form of how it is shaped, and what it is covered in. The drone will absorb signals and reflect them away, so that it cannot be detected by those on the ground. This ensures information can be recorded and passed on, without the source ever knowing what is going on. This gives surrounding countries and those in the West prior knowledge of when something adverse is likely to occur, and also reports back data that is interesting in terms of future planning. Stealth technology as we now know it, concerns being hidden from radar. However, radar wasn’t invented until 1935 and wasn’t really used effectively until World War 2 where the British used it to great effect. Prior to this, stealth technology was about avoiding being physically seen or hard to recognize. In 1912, German engineers produced a mostly transparent plane using a material based on cellulose. They also painted the frame of the plane in light colors so that it could not be easily seen in the sky. This ploy was effective when the plane flew at high altitudes and was used by the Germans in World War I. As radar became important in World War 2, stealth technology was more important than ever. Now, it didn’t matter if you couldn’t be seen by the eye, as the radar screen could tell exactly where you were. There was simply no hiding, or so we thought…. It was the British who first developed effective radar in WWII. This meant the Germans had to be particularly clever to avoid detection. One way they avoided the British radar was to coat parts of submarines in radar absorbing paint. They tried the same technique with airplanes too, but found that the several coats of pain that were needed would make the plane very heavy and difficult to fly. The 1960s brought the first truly radar invisible plane, the Lockheed SR-71 Blackbird. It could absorb radar signals and also divert them from being reflected back to the transmitter. It also had a special coating called iron ball paint, which could convert radar energy into heat. This reconnaissance plane was used by the US to get intel on the Russians during the Cold War. Stealth technology as we know it today involves being invisible to radar detection and also to infrared and acoustic signals. The US developed the F-117 fighter and B2 bomber to deal with these multiple methods of detection. These planes became common sights to us all after the US admitted their existence in 1980. To become invisible from view, aircraft generally use particular colors to blend in with their background. A plane operating at night would be best painted black to be harder to spot in the dark sky. Planes that operate during the day are painted a special shade of blue to mix with the daytime sky. Special consideration must be given to the cockpit area which can cause reflections. Currently, a smart technology where an airplane can change it’s appearance much like a chameleon or octopus is being researched. These are electromagnetic waves that are invisible to the human eye. They have a wavelength of around 12 inches to 0.00003 inches. Hot surfaces emit more infrared radiation than cool surfaces, so if there are parts of an aircraft that are emitting heat then they will be easy to detect. To counter this, stealth planes mix hot exhaust emissions with cooler air before they are released. They also coat areas that run hot with special materials that spread the heat over a larger area, which lessens the impact. Heat-seeking missiles detect their target using infrared and they can be confused using special infrared jamming signals. If you can hear an airplane it’s going to be pretty easy to locate it right? For this reason, modern stealth jets can use special sound suppressors and mufflers to quieten their noise output. They also use very small engines that make little noise. This has the added effect of making less heat which helps detection by infrared radiation. The engine bay is also lined with acoustic treatments to make it as soundproof as possible. Radar works by sending out electromagnetic waves in a direction. If the pulse is reflected back then an image or an idea of the physical presence of an object can be derived. It does this using the differences in delay time of the received signals. Radar signals can be manipulated in a variety of ways. They can be absorbed by an aircraft. By emitting inverse signals they can be cancelled. They can be scattered or reflected away so that they are not received by the radar antennae. To absorb the signals the aircraft must be coated in a special paint. Metallic surfaces are very reflective and not good for stealth vehicles. For this reason some planes use carbon and glass fiber and plastic as much as possible. It’s also very important to cover any vents in the plane with absorbent materials. If a radar signal was to enter the plane then it could resonate and amplify. This would make it easier to detect. To make sure radar signals are not reflected back to the antennae, the shape of a plane is very important. They are built with angles everywhere, which scatter the radar signal in every direction except the one from which it came. Well that’s it for our guide to stealth technology. Check back soon for more informative posts. We get a lot of our ideas for technology straight from nature. Check out our guide on the top camouflage animals to see how they stay hidden. Check out our latest post on monoculars. They’re the perfect tool for viewing wildlife from a distance.